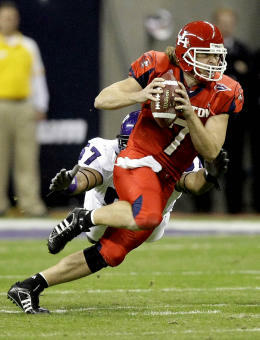 Case Keenum- Does he deserve to be drafted? 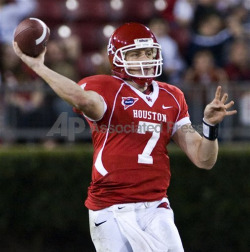 This blog post is focused on Case Keenum, the quarterback of the Houston Cougars. He is rather well known for his gaudy passing numbers but there is a lot more to a quarterback than impressive stats. Read on to find out why Keenum will be lucky to be drafted barring significant improvement as a senior despite all of the accolades he may get for his passing production. Case Keenum has impressive passing stats, but that isn't unusual for a quarterback operating out of a spread offense. First of all, Keenum operates out of a pure spread offense and is almost exclusively in the shotgun. If you haven’t read any of my previous posts, the reason this is such an issue is because when QB’s spend the majority, if not all of their time in the shotgun, they don’t get a chance to improve their footwork on their three, five and seven step drops. In addition, they don’t learn to read defenses from under center (where it is more difficult to judge what the defense is doing than when you are standing back in shotgun) and spread offense QB’s regularly look at only their first or maybe second read. All of those things are extremely hindering once they get to the NFL, and that results in a very high bust rate in spread offense QB’s. I was not surprised that he was operating out of the shotgun that often, but still it is disappointing not to see a sizeable percentage of snaps from under center mixed in. Second of all, Keenum did not strike me as an impressive QB despite his gaudy numbers and reputation as a quality QB. He panicked easily in the face of pressure, he left the pocket prematurely on a regular basis, and he rarely, if ever, went through more than one or two of his progressions the entire game. He forced passes into coverage, threw passes across his body at times and showed very little ability to buy time in the pocket by stepping up while still looking downfield. He didn’t look like he had very good mechanics, and when he is facing pressure he is more than willing to throw off of his back foot with no regard to his usual mechanics as far as I can tell. To his credit, he is accurate when he isn’t pressured as far as I can tell, and his throwing motion looks relatively clean. He also showed more mobility than I would have previously expected as he scrambled up the middle, bounced the run outside to avoid pursuit from the backside and scored on a 20 or so yard touchdown run in this game. So if the play breaks down he is a threat to run, which helps his value. 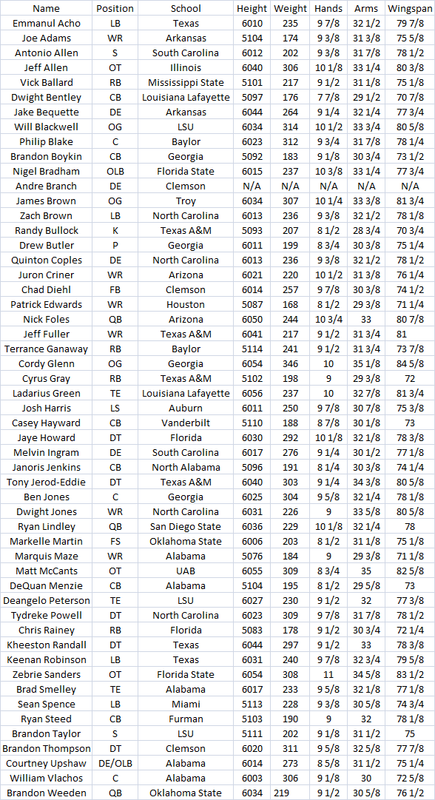 I project Keenum to be a 7th round draft pick, which is probably much lower than most NFL Draft sites. But I have my reasons. Overall I can’t say I am impressed with Keenum at all, but it was good to finally get a feel for how he plays the game. But I value poise under pressure, leadership and the ability to read defenses quite a bit, and Keenum did not impress me in any of those regards when I watched him in this game. I project him as a 7th round pick right now, but we will see how he looks during the season this year. You might look at his stats and think, wow, a quarterback who put up 5671 yards, who completed 70.3% of his passes, averaged 8.10 yards per attempt, and had 44 touchdowns with only 15 interceptions (that includes a whopping six interceptions against Air Force in Houston’s bowl game), he must really be something. Well, not quite in my opinion. I learned my lesson about trusting stats, especially when it comes to spread offense quarterbacks, a long time ago. I thought I’d pass that along to anyone who reads my blog. So now when your friends talk about how good Case Keenum is, feel free to tell them exactly why that may just not be the case.